This is a very simple series; I won’t be expounding on each Scripture very much, except through a bullet-point list to share some prayer pointers. I also will not be writing sample prayers, as I believe the Lord wants you to exercise your prayer muscles and make these Scriptures your own vocabulary for prayer. No weapon formed against you shall prosper, and every tongue which rises against you in judgment you shall condemn. This is the heritage of the servants of the Lord, and their righteousness is from Me,’ says the Lord” (Isaiah 54:17 NKJV). Remind the Lord that He promised to work all things out for your good, for you love Him and are called according to His purpose (Romans 8:28). Tell the Lord that you see the weapons coming against you, but you know He sees them too. Thank You that nothing is hidden from His sight, and you are hidden in Him in the secret place of the Most High–where you are safe. Remind the Lord that He promised that no weapon formed against you would prosper. Therefore, ask Him to defend you against the enemy’s onslaught and totally obliterate the attack against your life. Remind the Lord that He said when the enemy comes in like a flood, Holy Spirit will raise up a battle standard against him. Point out to the Lord that the enemy is coming against you like a flood right now, and ask Father God to lift up His battle standard against the enemy and not allow the enemy to pass through the Father’s protection around you. Ask the Lord to help you walk in integrity and uprightness, no matter what. Thank the Lord that every tongue that rises against you in judgment, you shall condemn. Ask Him to fight against every accusation, for they come straight from the accuser of the brethren, who is Satan himself. Ask Father God to expose every lie that comes against you as the lie that it is. Ask Him to make the truth plainly known to all parties involved. Ask the Lord to make your right standing with God obvious to all people. Remind Him that you are the righteousness of God in Christ, and ask Him to vindicate you. That’s our breakthrough prayer for day 3! Praise be to the Lord. The devil is liar. Our Lord is our Protector and defender. Thank you father God in the mighty name of Jesus. Amen l prayed Isaiah 54: 17 over me today. Hallelujah! I have prayed all 3 days. Thank you Jamie for this series of prayers. 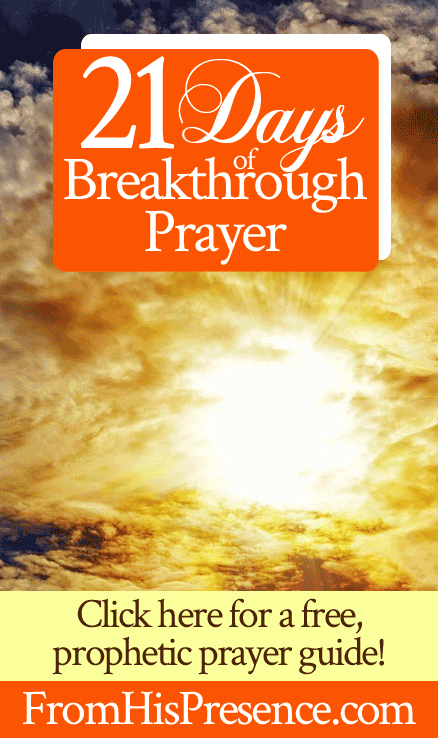 I need breakthrough in my life. God Bless you. Amen ,Jamie! Thank you so much! God bless you so very much! Hallelujah for this day and every day but especially this one. Yesterday I was asked to bring forth the word during our youth night at church and I knew the warfare was gonna come. It started last night I became really irritated with a friend over a harmless conversation, so I had to ask Father to help me recognize the enemy. Then today I was hit with some she say type of information about my job and this prayer strategy for today was and is right on time. I ask you all to be praying for me I am praying for a new position and trusting God but I need all the prayers I can get. I am truly grateful to God for using you Jaime in such a mighty way. As I continue to use these breakthrough prayers (because I have a very serious and urgent petition before Papa God for my daughter), I always feel the warmth and calm assurance that Her victory is nigh. Day 3 in particular hit home because I pray that God will expose the lies and the perpetrators of these lies so that the truth be told and my daughter be vindicated and her job restored. Time seems to be running out but because she dwells in the secret place of the Most High and under the shadow of the Almighty, I have no doubt that God’s miraculous intervention will result in success and A Testimony for her, thus increasing her faith and trust in Him. “May God continue to bless and use you Jaime!” My Testimony will be posted here for sure, so that other Presence Seekers may know how truly GREAT and POWERFUL our God is. These prayers are such a blessing to me and my family. Thank you Jesus for being superior to all and for the amount love you have for your children.